Note: This is a guest column courtesy of daily and weekly fantasy baseball site DraftStreet.com. Brandon Beachy last pitched for the Braves in June 2012 and has been out since then after undergoing Tommy John surgery. But he’s now back making rehab starts in the minors and on track to return to the Braves soon. Beachy, now 26, has only 41 major-league starts. But in 25 starts in 2011, Beachy struck out 169 in 141 2/3 innings for a K/9 of 10.7. Beachy had a 3.68 ERA and 1.21 WHIP. 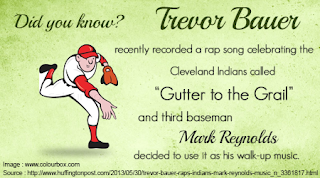 Beachy made 12 starts in 2012 before getting hurt, during which he had a 2.00 ERA and 0.96 WHIP. His K/9 fell to 7.6. When Beachy returns, the Braves may not have an obvious candidate to drop from the rotation. Mike Minor is having a great year while veterans Tim Hudson and Paul Maholm are unlikely choices for the bullpen. That leaves Julio Teheran and Kris Medlen. After a rocky April, Teheran had a 2.60 ERA and 1.04 WHIP in five May starts. On June 5, Teheran had a no-hitter against Pittsburgh broken up with two outs in the eighth inning. Teheran ended up allowing no runs, one hit and two walks in eight innings while striking out 11. On June 10, however, Teheran allowed five earned runs in six innings against San Diego. Medlen had a WHIP around 1.35 in April and May with the help of 24 walks in 64 2/3 innings, but in his first two starts in June, Medlen allowed no earned runs in 13 2/3 innings with 12 strikeouts and just one walk. However, on his June 13 outing, he experienced elbow inflammation and was shut down temporarily. He recently threw a bullpen session to get back on track. Michael Pineda last pitched in the majors in 2011 when he was a rookie with the Seattle Mariners. Traded to the Yankees in January 2012 for Jesus Montero, Pineda has still not pitched for the Yankees as a result of tearing his labrum and undergoing shoulder surgery. But Pineda made his first rehab start on June 9 and could finally join the Yankees some time in July. 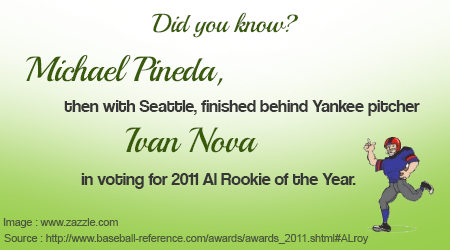 In his only season to date, Pineda made the All-Star team and finished fifth in voting for 2011 AL Rookie of the Year. His 9.1 K/9 was second-best in the AL behind Toronto’s Brandon Morrow. Pineda had a 3.03 ERA and 1.04 WHIP at the All-Star break, but went 5.12 and 1.22 after the break to finish with a 3.74 ERA and 1.10 WHIP. Pineda’s ERA in Seattle was 2.92 vs. 4.40 on the road. Note: This a guest column from DraftStreet.com on fantasy baseball. When San Francisco traded Zack Wheeler to the Mets for Carlos Beltran in July 2011, Wheeler became one of several recent top ten picks to be traded without ever playing a major-league game for the team that drafted them. Wheeler was the sixth pick in the first round in 2009. Beltran hit .323 for the Giants in 44 games before leaving San Francisco as a free agent. Wheeler, one of the top pitching prospects in MLB, recently made his major-league debut, and is a hot free and cash fantasy baseball pick. The Diamondbacks traded Bauer, now 22, to the Indians last December in a three-team trade in which the main player they got back was shortstop prospect Didi Gregorius from Cincinnati. Bauer is generally considered a better prospect than Gregorius, but as of early June, Bauer was back in the minors and Gregorius was starting at shortstop for Arizona and hitting over .320. The Tigers sent Turner to the Marlins in the July 2012 trade that netted them Anibal Sanchez and Omar Infante. The new acquisitions helped Detroit get to the World Series. Sanchez had a 1.77 ERA in three postseason starts and Infante took over at second base. In 2013, Sanchez has struck out 17 in one game and pitched a complete-game one-hitter in which he struck out 12. Infante was hitting over .290 in early June. Turner started 2013 in the minors, but was called up at the end of May. In his first two starts, Turner allowed one earned run over 13 innings. The Reds traded Alonso along with two other former first rounders, Yasmani Grandal (2010, 12) and Brad Boxberger (2009, supplemental 43), for Mat Latos. Latos was 14-4 for the Reds in 2012 with a 3.48 ERA. This season, Latos was 5-0 with a 2.90 ERA after 12 starts. Alonso, the Padres’ starting first baseman, was hitting .284 when he went on the disabled list June 1 with a fractured hand. Catcher Grandal hit .297 in 60 games in 2012, but missed the first 50 games of 2013 after being suspended for PEDs. Grandal has also been linked to the Biogenesis scandal. Boxberger was brought up from the minors in early June to join the Padres’ bullpen. The Indians gave up Pomeranz in a 2011 deadline trade that landed them Ubaldo Jimenez from the Rockies. Jimenez has generally been awful for Cleveland, with an overall ERA over 5, though he was doing better as of early June. Pomeranz went 2-9 in 2012 with a 4.93 ERA. His ERA was almost exactly the same at home as on the road. Pomeranz is back in the minors this season, but is pitching well and could be back in Colorado before too long. Pomeranz is 24. For more information on cash fantasy baseball, click here. Brian Cashman, reality TV star? Where is Tabatha Coffey when you really need her!? Remember back when Brian Cashman was a nebbishy, likeable dude who didn't run around acting like his you-know-what didn't stink? Now, he's a nebbishy, unlikeable jerk who thinks he's a reality TV star or something. How long before he does one of those "Real Housewives" table flips? Yet most of the NYC media continues to give him a pass; they act like it's still 1998, and poor Bri is under the thumb of The Boss. They haven't realized that Cashman now acts as bizarrely and angrily as Steinbrenner ever did. The thing is with Cashman, he is not a good GM (and why is it that the Yanks miss out on signing players directly from Cuba and Japan because of Jose Contreras and Kei Igawa, but Cashman persists on trading for or signing every aging, injury-ridden has-been under the sun?) but he is good at continuing to snow the media. This, even though his behavior is increasingly erratic, arrogant (remember his K-Long screed from last week?) and just plain weird. Most of the mouths had Cashman’s back, regurgitating similar lines about “everybody” in the Yankees organization being “sick of the drama” Rodriguez brings. Or how “STFU,” as Buster Olney reported, is a “common refrain” throughout the pinstriped hierarchy when it comes to A-Rod. Then there were those who either don’t know — or forgot — about Cashman’s propensity for losing his temper, which he has done with several reporters we have interviewed over the years. “Brian is a bit of a loose cannon — now,” Don LaGreca said Wednesday on 98.7. Sorry, folks, but I don't believe for a minute the bizarre story in today's sports media about how A-Rod is secretly trying to be declared unable to perform to play, and thus retire for medical reasons and get paid the full amount of his contract, and risk potentially going to jail for insurance fraud, all because he doesn't want to lose money from a possible suspension. This is the story Bill Madden and Teri Thompson are claiming in today's New York Daily News, and I just don't buy a word of it. Alex Rodriguez has 114 million reasons for telling the world that he has the green light to play baseball games again. According to sources close to the ongoing drama surrounding the star-crossed Yankee third baseman, Rodriguez and his advisers are so concerned that Major League Baseball’s drug posse is quickly closing in on him that they have racheted up the timetable for him to return to game action. Once he’s back playing in rehab games, the sources say, he could then claim he is physically unable to perform because of the serious hip injury he is recovering from, “retire” from the game, and still collect the full amount of his salary — $114 million over the next five years. Depending on whether MLB can show that Rodriguez acquired performance-enhancing drugs from Bosch . . . or that he engaged in a repeated pattern of use . . . or that he lied to baseball investigators who have interviewed him several times over the years about PEDs, he could face a 50- or 100-game suspension, or even a lifetime ban. First off, if you are going to write such an accusation, can't you even take the time to get the figures right? He has already been paid close to $14 million for this year's salary, making the amount still owed to him more like $100 million over the next four and a half years. Second, look who is being "credited" as sources for this: "According to sources close to the ongoing drama surrounding the star-crossed Yankee third baseman." What does that mean? "Sources close to the ongoing drama" could mean that this was planted by Yankee officials engaging in wishful thinking, or for that matter, tabloid reporters looking for a headline or even the towel guy in the clubhouse. It certainly doesn't mean a source close to Rodriguez. Third, you mean to tell me that A-Rod started Twitter and Instagram accounts to post upbeat reports on his recovery, and got in trouble with Yankee brass about having the nerve to say that the doctor who performed his hip surgery has cleared him to play, all for some secret motive not to play, but to retire? Really? At any rate, it seems to me that if A-Rod had some secret plot to get the contract completely paid for, he would be posting about how much pain he's in, how the rehab is going terribly, etc. Why in the world would he do just the opposite? Fourth, Madden and Thompson have now ratched up the 100-game suspension speculation on A-Rod -- which was always a reach -- to the possibility of a lifetime ban. Really? What is your evidence, dudes? It is certainly not official MLB policy, which only allows a 50-game suspension for a first offense. As much as you guys may hate A-Rod as history's greatest monster, the chances of him getting a lifetime ban for this are non-existent. Finally, let's review what Madden and Thompson are claiming. They want you to think that Alex Rodriguez, who has wanted to be an MLB player since he was in grade school, who loves the game so much that he goes home each night and watches other teams play on his MLB page, is going to risk insurance fraud, and the possibility of going to jail, all because he might lose 50 games of salary out of the 720 or so games he could still play in over the course of his contract? He is going to walk away from the game that he loves forever, without any chance at redeeming himself on the field, all because he may get suspended? He is going to hand the Yankees a huge victory in having most of his contract paid for by insurance, and getting him off the team? We heard a lot of the STFU acronym over the last few days. I will add my own profane acronym to my assessment to this story -- NFW - as in No F****** Way is this story true. Who has worse judgment -- Alex Rodriguez or Brian Cashman? Geez, I didn't even get to write about all the ways Alex Rodriguez could get into trouble with his brand-new Twitter account, before he got into trouble with his brand-new Twitter account. But as social media goes, A-Rod's tweet was not really all that controversial -- until Brian Cashman made it so, that is. "You know what, when the Yankees want to announce something, [we will]," Cashman told ESPN New York. "Alex should just shut the f--- up. That's it. I'm going to call Alex now." Get your popcorn ready! It's always fun to hear a guy who jumped out of an airplane and broke his leg, who broke up his marriage, and who gave Kevin Youkilis $12 million this year, criticize somebody for bad judgment and tell him to shut the bleep up. It would kind of be like Kim Kardashian and Kanye West, parents of baby daughter North West, getting in Gwyneth Paltrow's face about naming her child Apple. By the way, why hasn't anybody in the New York sports media (other than Squawker Jon, that is) -- noticed that Cash recently signed former Met Fernando Martinez, who has been named in the Biogenesis scandal? Don't you think it would be kind of difficult for the Yanks to try to void A-Rod's contract after doing so? My favorite part of this story, aside from the sheer hypocrisy of Cashman, the guy who publicly criticized his own team's ownership for signing Rafael Soriano, criticizing A-Rod for speaking out of turn, is this rather meek response after Cash got all George Costanza in a snit fit, bellowing "That's it. I'm going to call Alex now." According to ESPN New York, "Cashman ended up emailing Rodriguez and did not get an immediate response." That's it? He sent an email? What, did A-Rod see Cash's number show up on his caller ID and let it go to voice mail or something? Ha! You know, I have been saying this last October than A-Rod ought to let loose and say what he really thinks about Cashman, Joe Girardi, etc. Wouldn't it be great if he actually did, without the filter of the New York sports media to censor his words? Dare to dream! For information on where to buy New York Yankees tickets, click that link. Well, this is surprising. I logged onto Yankees.com tonight, and saw that there are still plenty of seats available for Old Timers Day. There are face value tickets for as little as $22 from Yankees.com,. In addition, I have gotten a slew of promotional emails this week for OTD. It used to be that Old Timers Day was the second game of the year to sell out after Opening Day. But as the folks at Tiqiq say (see below), it is still a top seller, as compared to other Yankee games this year. Sunday is Old Timers Day at Yankee Stadium, as the Yanks welcome many former players back to the stadium in only a way the Yankees can do it. The day is always a special one in the Bronx, and also is always a huge success at the ticket office for the Yankees. While Yankees tickets for Saturday's game are going for an average of $91, the price on Sunday for Old Timers Day is $114, with a get-in price of $16. At $114, tickets for Sunday's game are currently 27% higher than the Yankees 2013 home average and is also the most expensive game at The Stadium this month, which is saying a lot considering they have played or will play the Red Sox, Dodgers, Rays, and Rangers in June. The other day, I made a cynical, joking reference to Brian Cashman's obsession with the 2004 Boston Red Sox, and now there is a chance that my reference -- about Manny Ramirez -- could come true. Oh, great. Can't I make a winning the lottery reference and have *that* come true instead? Here's what I am talking about: Kevin Youkilis was the eighth member of the 2004 Red Sox to become a Yankee -- not a coincidence. And Cashman said recently regarding Youk's signing that he did "so much for Boston over the years." Anyhow, I wrote Wednesday: "Did Cash understand that Boston traded him because he wasn't really any good anymore? Manny Ramirez did a lot for Boston over the years, too, but I don't want him as a Yankee in 2013 either." That was a joke, of course, because as of June 19, Manny was a washed-up has-been playing in Taiwan. But as of June 20, Ramirez is leaving Taiwan, and says he wants to play Major League Baseball again. If you don't like the idea of Manny Ramirez playing for the New York Yankees, you have absolutely no sense of adventure. Sure, Yankees general manager Brian Cashman has steered the franchise far from players with the kind of baggage that accompanies Manny. Well, other than signing Youkilis -- a Red Sox who wasn't exactly a BFF of the Yanks, and who threw temper tantrums all the time. Or bringing back Home Run Javy Vazquez. Or trying to bring back Carl Pavano, arguably the most despised Yankee of all time. Or getting Raul Mondesi. Or bringing back Roger Clemens, me-first "family days" and all. Here's where Cashman can lean on the franchise he has built. In going for Vernon Wells, Lyle Overbay, Travis Hafner and others, Cashman went for guys with a team-first attitude who would understand that playing for the Yankees is a privilege. Manny is a lot of things, but dumb isn't one of them. He knows what the Yanks represent. Ramirez surely would know that they could provide him with the opportunity to put a better finishing touch on his career. He would also know they wouldn't put up with him misbehaving. 1. Actually, the people cited there were just happy that any team wanted them. That's more to the point than the team-first hooey Again, Cashman tried to re-sign Carl Pavano, the antithesis of team-first. 3. Whether or not Manny misbehaves isn't an issue (although it is fascinating to see Justice write such a puff piece on Manny, given how much he has described A-Rod as history's greatest monster.) The real issue is that Ramirez is 41 years old, hasn't been a good major league hitter for years, and has failed three PED tests. Think about that for a second, if the Yanks do try to get Ramirez. If they go after him at the very same time they are acting like the victims when it comes to A-Rod's links to BioGenesis, they would be the biggest hypocrites ever. Not that Justice or any of the other suckups in the New York media would ever point out such a thing. Anyhow, over the next few days, expect Cashman's minions in the media, and on other Yankee blogs, to talk about what a great, savvy move it would be to sign Manny Ramirez, paving the way for the inevitable. After all, Manny would be a quintessential Cashman signing -- he's old, past his prime, a steroid user, an ex-Red Sox, and he killed the Yankees time and time again. Why not overpay for him to supposedly stick it to the Red Sox, Cash will think. Good grief. Tuesday was a great day for top Met prospects, but as Met fans know all too well, the results haven't always been quite so spectacular. Fernando Martinez, the great hope just a few years ago, was finally waived by the Mets last year. This year, he was DFA'd by the Astros on the same day they DFA'd Rick Ankiel. Just as the Mets learned with Ankiel that when you're not good enough for the Astros' outfield, you're probably not that good, the Yankees now have a chance to learn that with Martinez after trading a rookie-ball pitcher for him. Martinez does have one characteristic that could help him fit in with the Yankees - he's been linked to the Biogenesis scandal. Zack Wheeler's successful debut on top of Matt Harvey's sensational Game 1 start offered a preview of a potentially great future for the Mets, but even the Mets do end up with two healthy aces, the current team is still a long way from contending. Before yesterday's win, Harvey had only won one of his last ten starts due to his lack of run support. The Mets won only four of those games, going 4-6 for a .400 winning percentage. Even after the Mets' doubleheader sweep of the Braves, they are just 27-40 with a winning percentage of .403, third worst in baseball, ahead of only the Marlins and Astros. Sure, I'm excited that the Mets swept the Braves behind Harvey and Wheeler, but I was excited when the Mets swept the Yankees just three weeks ago and the Mets promptly lost nine of 11, including four to the Marlins. Today, the good feelings again figure to end abruptly as Shaun Marcum and his 5.43 ERA take the mound. And the Mets are considering sticking with a six-man rotation? Except for his long relief outing in the 20-inning game, Marcum has been awful. Hey, here's an idea - why not use him in long relief? Kevin Youkilis: Biggest waste of Yankee money ever? So much for that tough, fierce New York sports media. I haven't seen a single one of them criticize Brian Cashman for the disaster that was the Kevin Youkilis signing, so that means I have to squawk again on this subject and say something! You would think somebody would notice that throwing a heap of money at an injury-ridden 34-year-old who had missed more time in recent years than Alex Rodriguez did, the man he was replacing, was not exactly a good idea. Now, in the least surprising move since Amanda Bynes tweeted something insane, Youk needs back surgery after playing all of 28 games for the Yankees this season. Since he will need to miss at least 10-12 weeks due to the surgery, the Kevin Youkilis Experience in pinstripes is most likely over. These are Carl Pavano-esque numbers of futility. I would do the math on Vernon Wells, too, another "great" Cashman move, but I am afraid my head would explode! Oh, and before somebody points out how much A-Rod is making, we 1) all can agree that he is vastly overpaid, but that 2) he got his own ridiculous contract the year after he had the best season for a Yankee hitter in 50 years, not after he hit .235 and spent 40 games on the disabled list. As I always say, Lindsay Lohan is a great actress when sober. But that doesn't happen very often. Clapping your hands and believing in fairies and thinking that a chronically injured player would miraculously be healthy just because he now wears pinstripes is more of Cashman's magical thinking. He did literally the same thing with Nick Johnson, to similar results. As for the idea that Youk is "the type of player that, if you could draw it up, that’s the type of player you’d want," I would want somebody who didn't spend most of his season on the disabled list, and who didn't throw temper tantrums all the time. But that's me. As for Youkilis doing "so much for Boston over the years," did Cash understand that Boston traded him because he wasn't really any good anymore? Manny Ramirez did a lot for Boston over the years, too, but I don't want him as a Yankee in 2013 either. One of my brothers, who has a bad back, pointed out the silliness in Cashman's comment about Youkilis passing the Yankee physical with flying colors. He said that with back issues, unless you have something like a herniated disc which would show up in an x-ray or MRI, chronic back problems may not necessarily show up in a physical. That is something Cashman should have known, given that he is the supergenius GM and all. Anyhow, don't expect that tough, fierce New York media to say boo to Cashman about any of this. Shocker. I had to laugh to keep from cringing when my Red Sox friend Johnny pointed out to me Brian Cashman's latest pontificating on the state of the Yankees. Specifically, my friend cited Cashman telling the media yesterday this shocking news about Kevin Youkilis: that "back issues usually don’t get better." Gee, you think? Next thing you know, Cash will figure out that jumping out of an airplane could possibly result in injury! It's amazing -- when the Yankees got off to a good start this year, Cashman got all the credit. Now that they're struggling, it's all apparently issues beyond Fredo's control. You know, bad luck like a guy who has been chronically injured for the last five years, missing significant time on the DL every single year, having his back bother him again, and feel even worse after he played every inning in the Yankees 18-inning game last week. Shocking, I'll tell you. Shocking. Only the Yanks would get "younger" (Youk will be 34 in March) with a player who misses 40 to 60 games a year, and who has been on the DL pretty much every year of his career. Only the Yankees would replace an overpaid, frequently-injured third baseman with an even more brittle version. And give him $12 million (!) to do so. I said then that I "would have been happy with a rookie or role player who can play decent defense and can stay healthy," but noted that "the Yanks are more interested in big names for ratings on the YES Network than with having some nobody (the horror!) field the position." Speaking of the ratings, they are down 38% from last year, the Wall Street Journal reports. And last year's ratings were the lowest since 2003. First of all, I don't remember Youkilis being offered a two-year deal by the White Sox, and I was unable to find evidence of it online. Second, even if we say for argument's sake that they did, nobody offered Youkilis anything close to $12 million in one year, the way Cashman did. Third, it makes no sense for Cashman to justify his deal based on what another team did. Lots of GMs do stupid things. Cash should know. "It is alarming that K-Long would say that to the group of reporters, but he has never said that prior to that," Cashman said. "This is a lot of times how things work out when things go bad, things get said. If K-Long felt that way, we should have heard that from K-Long, but we never heard that from K-Long. "Before anyone asks, 'Am I mad at Kevin Long because of it?' No, but do I think that commentary jives eternally in that clubhouse regarding this player prior to him going down? The answer is absolutely not. ... Some people are better with the microphone than others." Um, Bri, there is a really cool invention called a pronoun. Instead of saying K-Long (and who invents these nicknames, anyway -- K-Long is so 1997!) a hundred times, you can say "he" or "him." And the word is "jibes," not "jives." You're welcome. Note to the media: What part of 'A-Rod has a guaranteed contract' did you not understand? "One source familiar with the case said the commissioner's office might seek 100-game suspensions for Rodriguez, Braun and other players, the penalty for a second doping offense. The argument, the source said, is the players' connection to Bosch constitutes one offense, and previous statements to MLB officials denying any such connection or the use of PEDs constitute another." That is a real reach, given that the MLB Players' Agreement clearly states that a first-time offense would be only 50 games. Using that logic, every player who denied being dirty and appealed a test would have had to have been suspended for 100 games for lying about it. MLB may try this, but they are not likely to win. If A-Rod, Braun, et al are proven to have juiced, then they deserve to be punished. But forget about them getting 100-game suspensions. 2. Note to the media: Stop talking about how the Yankees really ought to give A-Rod the what-for and void his contract: We have been hearing this nonsense for months, and it will never happen. What part of "A-Rod has a guaranteed contract" do you all not understand? The New York Post's Joel Sherman, who should know better, makes some noise about it today. And the Star-Ledger's Steve Politi has a whole screed today talking about the Yankees' voiding the contract, and that even if they are unsuccessful, this will be the end of his time in pinstripes. "His career in the Bronx, already in doubt because of his broken-down body, is over now." Really, Steve? Have any evidence to back that up? I suppose the Yankees could release him tomorrow, and eat the 100+ million still owed him, but I strongly doubt that will happen. 3. PED suspensions happen the same time a player is on the DL: If A-Rod and Cervelli are suspended, they would conceivably serve that suspension at the same time they are on the disabled list (of course, Cervelli is supposed to be back within this month.) I wrote in 2010 about how ridiculous it was that a player like Edinson Volquez could be on the DL with Tommy John surgery, and not miss a game due to a 50-game PED suspension. Anyhow, if you really want to get PEDs out of baseball, start with taking away wins and punishing managers and general managers, instead of just the players. If team front offices started suffering personal financial consequences from players juicing, they would be much better at policing their own teams.